Unlike iPhone & iPad, in most Android devices you can plug an external SD card to increase the memory of the device. The external SD card is usually used for storage of pictures, music and videos. 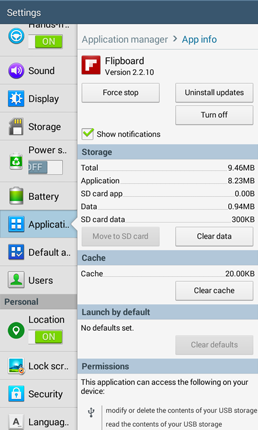 Actually, a few apps can also be moved to external SD card from internal storage which will reduce the occupation of the app on room so that you can install more apps. You can take the following procedures to do this but remember, this is not for all apps. Press the "Home Key" of the tablet and then touch the "Menu Key". Touch "Settings" and then find "Application" Tab. Find the app you want to move in the list, then touch it. You'll see there is a button named "Move to SD card", touch it and wait a few seconds, then the moving will be finished. If you find that the button "Move to SD card" is grey, then it means that this app can't move to your SD card. You can save the picture, music, video and documents in your SD card for that the support of portable SD card by Android is designed for these materials. This habit will save your device's room for more apps. Generally speaking, it is better to keep all your apps in the internal storage which can be read faster than external SD card. 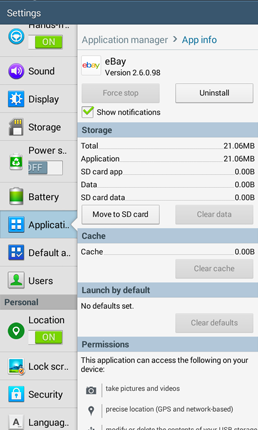 If you cut & paste an app's folder from internal storage to external SD card, this app might not run as it is designed for running only in internal storage.